At the end of last year, I went to an important networking event ran by Dundee and Angus Chamber of Commerce. I’m normally quite nervous about going to networking events but this one was focusing on the updates of Dundee’s Waterfront and the progression of the V&A Dundee. So I made myself go along and I’m glad I did. The Front- 89,282 Sqm commercial area including the railway station with the injection of new hotels, cafes, restaurants and slessor gardens for scope with outside events. And of course lets not forget the V&A Dundee, Scotland’s first Victoria and Albert Museum which will bring international tourists and many new visitors to the city. It’s fantastic what is happening to the waterfront but when you look up on the high street there are may empty shop units. 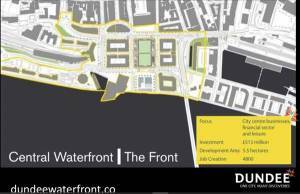 Dundee has a high rate of unemployment with the lowest rate of pay and there is a lot of poverty in the city, so it will be a massive boost to Dundee’s economy when the developments are complete, generating many jobs and bringing new businesses to the area. Then we heard from Andrew Cameron is one of the people involved in design within the V&A Dundee. He spoke about Design for Business and how design can help to solve peoples problems and enrich their lives. He said spoke of a fab design company called C4 who takes on interns and challenges them to create innovative products. They managed to redesign a spoon to help people with disabilities have an easier life. Designers put themselves in other peoples shoes and look in a different perspective to fix a problem. As a designer, we don’t come up with a finished product straight away. We empathise with the client, design ideas, create prototypes, refine and test them before we get to the finished product. It suddenly made me realise that I had stopped thinking like a designer and the business woman had taken over. I remembered that I had began designing jewellery as I wanted to help people feel better about themselves. To create a special, personal piece unique to each of my clients. To Reinvent a family heirloom so that my clients can continue to wear the piece and can carry their memories with them. I also wanted to help people feel loved and special (help them celebrity their engagement or wedding day) and help people stand out, to be confident with their own individual style. I also wanted to pass on my knowledge and teach handmade skills. Andrew’s talk had helped me to start thinking like a designer again. Andrew went on to say, the design economy is worth £71.4 billion of which Scotland represents 3.6%. People need to value design more as design is all around us. It helps societies and communities. Design solves problems and enriches peoples lives. Design encourages research and collaboration but most of all, it helps to make peoples lives easier, loved or more confident. It also made me realise that I had to value my skills as a designer and encourage people to appreciate handmade. And the way to do this is by education and practice. I hope I have made you rethink about how you feel about design and it’s value in people’s lives. So how can I help to make your life more enjoyable? Do you have a design problem for me to solve? Would you like a special engagement ring made for your soon to be fiancee? Do you have a big anniversary or birthday coming up? Do you have old jewellery laying in a box that could be revamped? Just get in touch with any of your jewellery needs.